Prime Minister Narendra Modi's recent two-day visit to Nepal on May 11-12 was described in media by some cross-sections for countering Chinese influence in Nepal, while some opposition parties in India alleged it was to influence the polls in Karnataka. While the latter is laughable, the former being routine in geopolitics, was certainly not the specific aim; but more for enhancing economic interdependence and socio-cultural linkages, even as Modi's foreign policy takes into account India's asymmetry vis-à-vis China and the need to calibrate India's strengths. This was Modi's visit to Nepal after 2015 when the 135-day-long blockade severely hit Nepalese economy, and for which Nepal blamed India. Nepalese Prime Minister KP Shatma Oli, then serving his first term as PM in 2015, stoked nationalist anti-India sentiment, winning huge public support over the blockade, and used the same plank during his reelection campaign last year. Modi began his visit from Janakpur where he offered special prayers at the 20th century Ram Janaki Mandir. He also offered prayers at the Muktinath and Pashupatinath temples. PM Modi held one-on-one meeting with Prime Minister KP Sharma Oli followed by delegation-level talks on all aspects of the bilateral relationship. 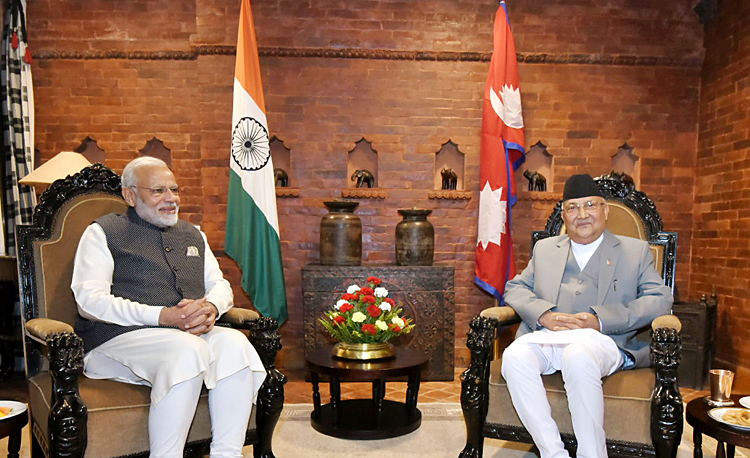 Meeting Oli twice in less than two months, Modi assured him that all genuine and necessary grievances of Nepal would be addressed in a time-bound manner; both sides agreed to resolve outstanding issues before September 19 that marks Nepal's Constitution Day. Modi also met political leaders of various parties. Both Prime Ministers jointly flagged off bus service between Janakpur and Ayodhya, and laid foundation stone of the $1.4 billion India-backed 900-megawatt Arun III Hydroelectric Power Plant in Tumlingtar in eastern Nepal. The plant is first of five mega hydropower projects, two of which are backed by Chinese companies. 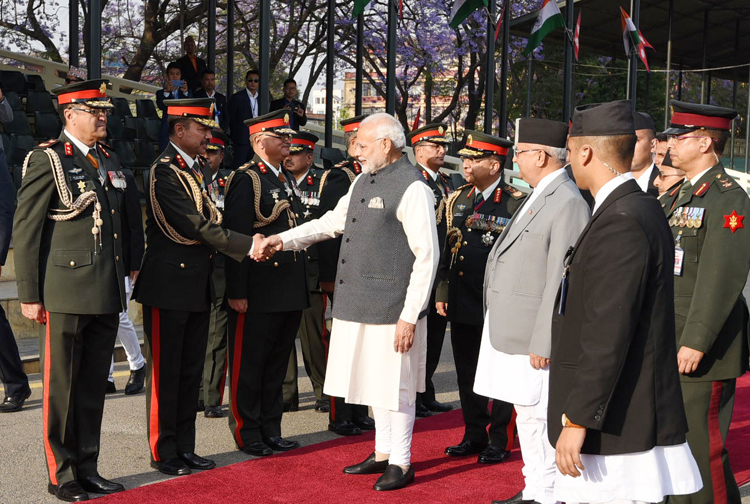 Following the inauguration, Modi said, "All misunderstandings with Nepal are over and the bilateral ties are heading to a new high. India stands shoulder to shoulder with the people of Nepal, India-Nepal ties are above inter-governmental relations. It is more like a family. I, the Indian government and the Indian people heartily felicitate the Nepali people for the progress made under federal democratic setup". Modi told the media, "We are connecting through waterways, railways, roadways, transmission line and oil line, and will cooperate in areas of security and defence". India is ready to partner with Nepal for cross border connectivity and agreed to commence survey to link Kathmandu with the Indian Railways' survey soon. A team of India experts will begin the survey for the feasibility of the rail linkages and India is also sending a team of experts to conduct feasibility survey for inland water navigation from Nepal to India. The two leaders also agreed for an early meeting for the construction of 46,00mw Pancheshwar Multipurpose Project jointly by India and Nepal. The India-Nepal joint statement issued by Nepal's Ministry of Foreign Affairs on May 13 highlighted following: second bilateral Summit of 2018 of two Prime Ministers and delegation-level talk held atmosphere of utmost warmth and cordiality; both leaders agreed for effective measures in implementing past agreements including initiatives in agriculture, railway linkages and inland waterways development; resolve to strengthen cooperation in diverse spheres and expand partnership for socio-economic development; need for regular convening of bilateral mechanisms, including Nepal-India Joint Commission at Foreign/External Affairs Ministers level; underscored importance of bilateral trade and economic ties - Oli stressing trade deficit needs to be addressed; Inter-Governmental Committee to jointly initiate a comprehensive review of the bilateral Treaty of Trade and amendments to Treaty of Transit and related Agreements; further steps to enhance economic and physical connectivity by air, land, and water; cooperation in water resources in areas like river training works, inundation, flood management and irrigation; enhanced bilateral cooperation in power sector in line with the bilateral Power Trade Agreement; for further strengthening bilateral religious and cultural ties, the two PMs jointly launched Nepal-India Ramayana Circuit connecting Janakpur, the birthplace of Sita, with Ayodhya and other sites associated with the epic Ramayana. underscored importance of regional and sub-regional cooperation under BIMSTEC, SAARC, and BBIN frameworks for forging meaningful cooperation in identified sectors. Nepal has China and India as its neighbours. Compared to India's $317 million investment commitment to Nepal in 2017, Chinese firms pledged more than $8.3 billion in investment. Nepal also formally joined China's Belt and Road Initiative (BRI) May 2017. But relationships don't hinge on economic investment alone. It is also involves engagement and sincerity. The UPA II government turned down a Nepalese government delegation 10 cr for opening a Think Tank in Kathmandu. In June 2103, China's Confucius Institute opened in Kathmandu University. Chinese Ambassador to Nepal described this fully Chinese funded venture symbolizing in-depth development of traditional Sino-Nepal friendship, cooperative achievements in the field of culture and education, emphasizing the institute will become the tie and bridge to enhance mutual enhance mutual understanding and friendship. China signed away agreement after agreement with Nepal while India waited for promulgation of the new Constitution. The Modi government started with a bang in 2014 with 'Neighbours First' policy but then the 'blockade' soiled the relationship. India has also not make good the promise made by Modi of HIT (highways, information ways and transmission) during his 2014 visit. 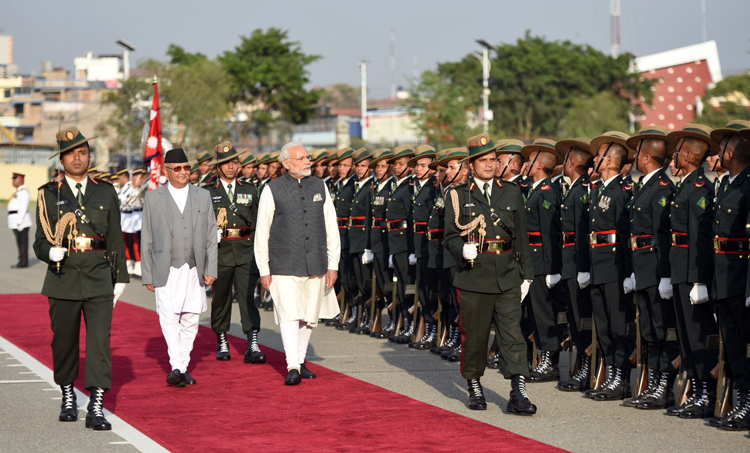 The recent visit by Modi to Nepal was after a gap of 41 months. With Myanmar, our first-ever joint military exercise was only last year. If we could reach out to China despite the Doklam standoff, perhaps prime minister-level visit (s) to Maldives were also warranted to keep the bilateral relationship running smoothly. If India lost strategic space in Nepal to China is of its own volition. Stung by the blockade, Oli visited Beijing in 2016 and ink 10 pacts, including for connectivity through rail and inland waterways, plus agreements for Chinese to build an international airport in Pokhara and get access to Chinese port facilities. Yet, India is Nepal's largest trading partner. Despite electoral rhetoric of the past, Prime Minister Oli also understands the need for stronger India-Nepal links to kick-start Nepalese economy, even as China has played its cards very well all along. He, therefore, is likely to follow a pragmatic approach, as indicated by his first foreign visit to India after assuming the second tenure as PM. To this end, the visit of Prime Minister Narendra Modi provides the right catalyst for boosting the bilateral relationship. Modi may again be in Nepal next month for the Bay of Bengal Initiative for Multi-Sectoral Technical and Economic Cooperation (BIMSTEC) summit. PM Modi has also extended an invitation to PM Oli for visiting India again, which the latter has accepted. Such frequent high-level interactions would certainly boost the bilateral relationship.